Ever since N. C. Wyeth bought a place in Port Clyde, south of Rockland, in the early 1930’s, the family has summered here, and Andrew Wyeth’s painting ”Christina’s World” is, for many people, synonymous with Maine. The Wyeth center is attached to the Farnsworth Art Museum, a respected 50-year-old institution that focuses on artists connected with Maine and that has built one of the best small, specialized collections in the country. They had advertised a collection I was dying to see. 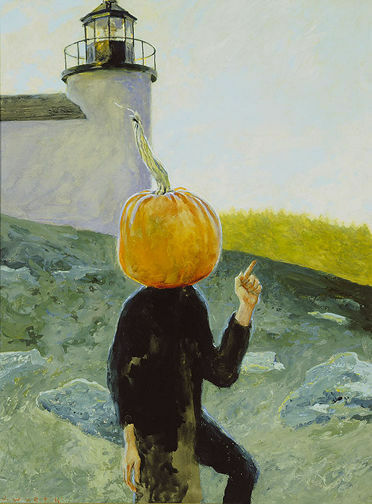 It was called, “Wondrous Strange: the Wyeth Tradition: Howard Pyle, N.C. Wyeth, Andrew Wyeth, James Wyeth.” You might or might not know that the three generations of Wyeths have a deep connection to Maine, and all three generations owe inspiration to Pyle. 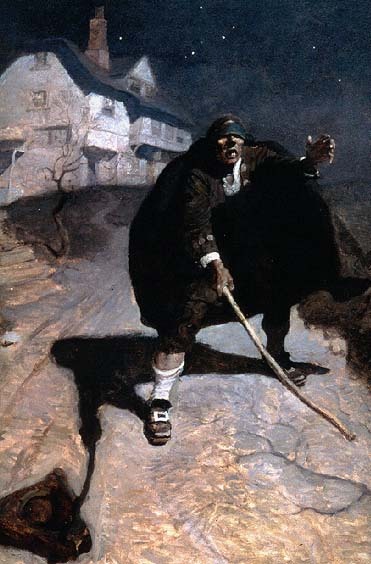 The generations went like this- Turn-of-the-last-century illustrator Howard Pyle; His student was N. C. Wyeth; N. C.’s student and son was Andrew Wyeth (wife Betsy); Andrew’s student and son was Jamie Wyeth. Betsy Wyeth chose the paintings and illustrations for the show I was driving to see, and named it Wondrous Strange. While Andrew and Jamie work in cooler times, there is no question that some of the images in ”Wondrous Strange” are really weird. Andrew paints a corpse emerging from a block of melting ice and severed hands perched on ice floes; Jamie portrays himself with a pumpkin head and as a clownish scarecrow. He depicts lighthouses with the same fierce perspective that his grandfather used for Peg Leg Pete. 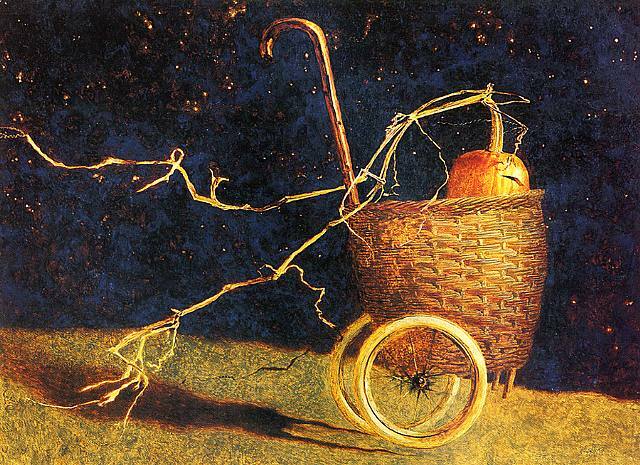 One of the paintings’ raison d’etre is described by the artist Andrew Wyeth himself as ”to memorialize the emotions he felt upon viewing his father, N. C. Wyeth, in his casket.” Yes. Weird indeed. Here are a few of the paintings that were mounted in that long-ago show. “Mischief Night,” by Jamie Wyeth. 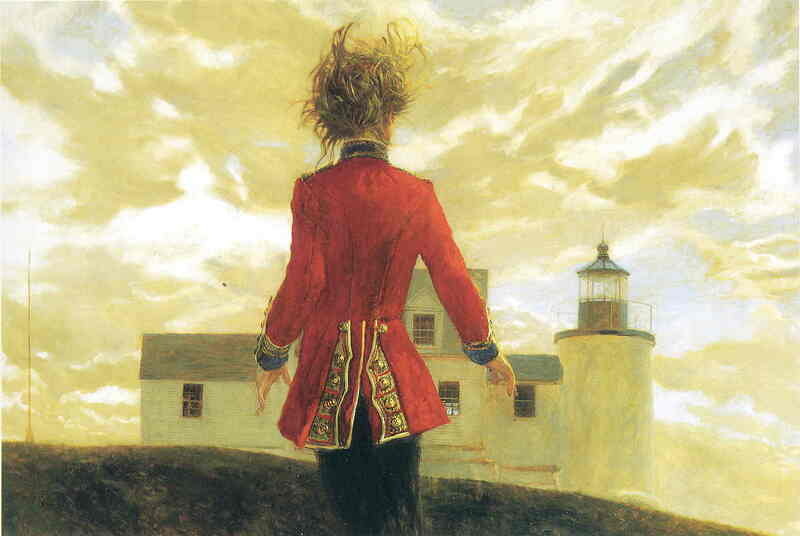 One painting that was included in the show was this one, called simply, “Lighthouse”, by Jamie Wyeth. This painting adorns the cover of the catalog/book. It’s eerie. There’s nothing particularly ghoulish about the scene. In fact, many other paintings were more weird and fiendish. But there is something maniacal and out of control in this painting. The scudding clouds evoke thoughts of monstrous hands strangling the world, the fortress-like lighthouse, the wild hair, the jarring vestment of a wrinkled military uniform worn on a wild hill… the painting is a perspective of the world that’s cracked, tilted, and agitated. Perhaps that was the appeal- weirdness, agitation, and ghoulish specter of the disquieting. As I said, I’d driven a few hours and it was going to be a day trip, no less. After seeing the exhibition and having lunch with the friend accompanying me, we’d turn around and drive home. The attraction of the wondrous strange to the pagan heart is strong. The question remains, how do I know that this Jesus of Nazareth, a man among men, was more than a man among men? You ask me to believe He was actually God incarnate? When did anybody ever stretch the credulity of the human mind more than when it is asked to believe that that simple peasant of Galilee was God dwelling in human flesh?! The mind of man couldn’t think it up. To think a Person in the Godhead, would unite humanity with deity, and suffer in that humanity and yet as deity, survive the wrath of the Godhead, that is something that when you read about it in the Bible you know it has to be true, it couldn’t be fictional. It is so strange, so wonderful so beyond human anticipation that it has to be a God-given reality. Well, you know of course why I spent time writing about the Wyeth wondrous strange exhibition. The mind of man I’d thought was so imaginative in painting and illustrating eerie and strange scenes, is not so wondrous strange after all. The REAL wondrous strange is the reality of the Gospel, of a God whose act of sacrificial incarnation, suffering, and death is SO strange that man had never ever thought it up in any religion, before or since. The wondrous strange mind of God, who had planned this devastatingly necessary separation of His Son from the Godhead since before the foundation of the world, in merciful love and grace, is the strangest wonder of all. As Halloween proceeds through this day, please ponder the most strange philosophy, Horatio, ever not dreamt of in earth, but is real and true from heaven.